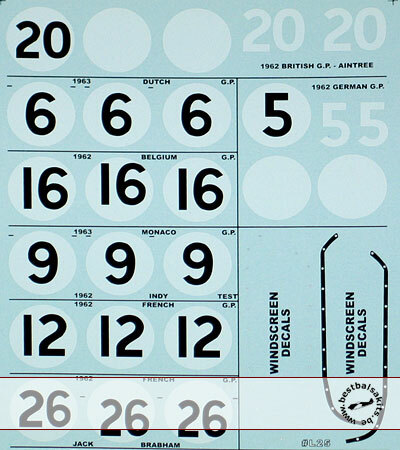 To be used along with the 1/20th 1962 Tamiya Lotus 25 kit decal. Includes Jim Clark numbers #20 1962 British, #6 1963 Dutch, #16 1962 Belgium, #9 1963 Monaco & 1962 Indy Test, #12 1962 France and #5 1962 German Grand Prix. Includes a template to cut out the early season windscreen and rivet decals to go around the windscreen. Also included are the #26's for Jack Brabham at the 1962 French Grand Prix in which he drove a Lotus 24B. The rear engine cover was slightly different on the Lotus 24B, pretty much the same otherwise.